PRICE REDUCED!!! Entering this property through the wrought iron gates you will see this well maintained home on over 4.5 acres with large pond. Sit on your dock and fish in the deep pond for big mouth bass, aerator on pier keeps this pond clear. Believe or not this is a manufactured 2001 home that is so custom you would think it was custom built home. 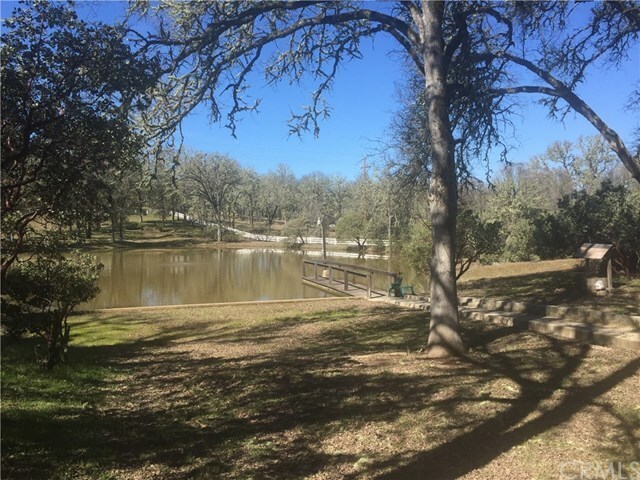 Home has covered front porch and covered back patio with hot tub that over looks the rolling pasture, numerous oak trees, pond, and fire wood storage. This is a 3 bedroom 2 bath home, of 1710 sq ft., 2 car garage, carport, plus workshop. Living room, dining room, plus family room with wood burning stove for the cold nights. Laundry room has water, dryer and second refrigerator which all stay. New upgrade corian counter tops in kitchen and bathrooms, and tile flooring. Master bedroom has new custom large walk in shower. Hardwood floor entry. Outside feature large fenced garden area with sprinklers, chlorinated, water softener, RV pad with hook ups and large pad, the property is enclosed with a new wooden fence and several access gates.